Aerospace is a world-leading sector which generates well-paid jobs, high-tech exports and sustainable growth across the country; to sustain this industry we need to ensure that we have access to a diverse range of innovators and leaders of the future. In support of the sector’s continued growth 53 companies and organisations within the UK’s aviation and aerospace sectors are now making a commitment to work together to build a more balanced and fair industry for women by launching the Women in Aviation and Aerospace Charter. The charter reflects the aspiration to see gender balance at all levels across the industry by both women and men in the sector. Women are under-represented in aviation and aerospace. They comprise only 4% of commercial pilots, and there is a well-recognised shortage of women studying science, technology and engineering (STEM) subjects compared to men. Trying to increase women studying these subjects and choosing careers in the industry is a key goal for the future of the aerospace industry. With the charter’s aim to address gender balance and support progress of women in senior roles, it is hoped that this will address the requirement for role models and allow for more insight into the diverse range of opportunities that are available within our sector to young people starting out in their education and young professionals starting their careers. Men have an active role to play in their support of women in leadership roles and as champions of diversity within their organisation through mentoring and challenging the norm. At the Women in Aviation and Aerospace panel session at Farnborough International Airshow it was noted that the majority of panels are normally male dominated. Opening up opportunities for women to discuss key subjects within our sector will give them a platform to act as role models. Equal representation is needed to normalise a mixed panel of industry experts to a mixed audience. 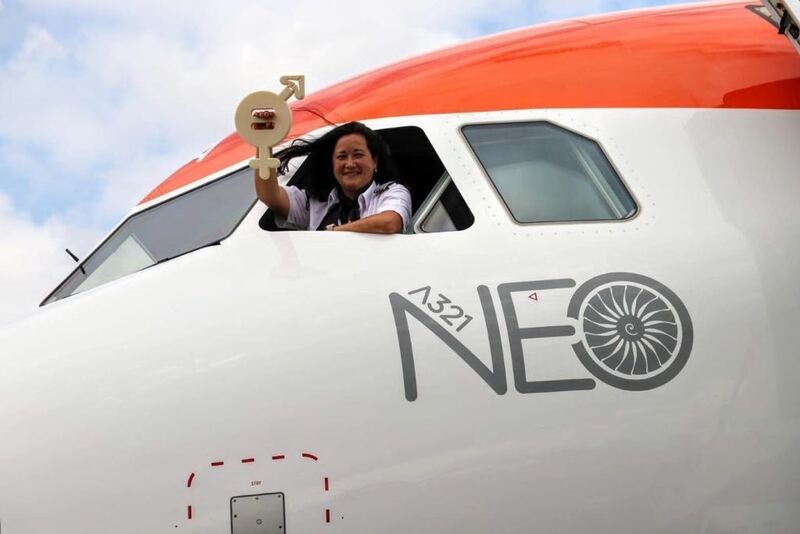 One initiative has been to emphasise the roles of female pioneers in aviation, drawing on role models from the past. Amy Johnson was the first woman to fly solo from the UK to Australia in 1930 and, amongst other achievements, became President of the Women’s Engineering Society, before dying in World War Two as a member of the Air Transport Auxiliary (ATA), responsible for flying military aircraft from factories to airfields. The Royal Aeronautical Society runs an annual Amy Johnson lecture, aircraft and schools have been named after her, and films have been made about her life. And the Aerospace Technology Initiative’s Amy Johnson Challenge, for the future of flight, aims to put British aerospace at the forefront of electric and hybrid aircraft – just as Amy Johnson was a pioneer of women in aviation in the 1930s. The past couple of weeks also saw the death of Mary Ellis, who was a colleague of Amy Johnson in the ATA and an aviation pioneer herself. Thanks to a father who paid for her to take a trip up in an Avro 504 when attending an airshow as a child, she had already developed her interest in aviation to the extent of paying for lessons and achieving a flying licence by the outbreak of the war. She made more than 1,000 flights, flying 76 different types of aircraft and including more than 400 of the Spitfires. Delivering a Wellington bomber to an airfield in East Anglia, the ground crew refused to believe she had flown it. In her own words: “They could not believe women could fly these aeroplanes and it was a surprise for them to see me — a slim, blonde, 5ft 2in female flying such a giant aircraft”. After the war, Mary Ellis continued as a pioneer, becoming Managing Director of Sandown Airport on the Isle of Wight for more than twenty years – the first female airport head in Europe. While there she recruited a friend – and another female pilot – Vera Strodl, as chief flying instructor. Under their supervision and instruction, Sandown became a key location for the training and development of female pilots. So what is the value of diversity within the industry? Diversity not only has financial benefits, but it also helps to improve decision making, it fosters innovation and creativity though a greater variety of problem solving approaches, perspectives and ideas. The Women in Aviation and Aerospace Charter is the first step in challenging the industry to work towards change in our sector. The industry needs to continually challenge itself to work towards being inclusive in order to see the benefits within our sector.